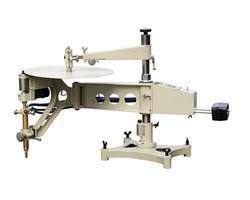 We are a prominent trader and supplier of superior quality Portable Profile Gas Cutting Machine. Our vendors' engineers manufacture these machines using finest quality raw material and sophisticated technology. The main body is made of aluminium by die-casting precisely. Speed system is adjusted by the integrated circuit, keeping running steadily. Looking for Profile Gas Cutting Machine ?